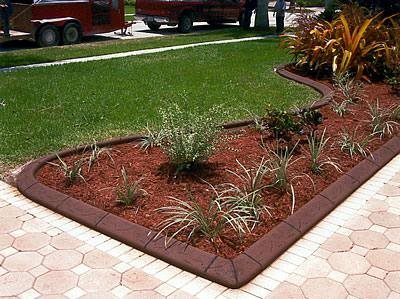 Transforming your homes' landscape can be as simple as adding special touches with borders and curbing. These types of finishing applications can really make or break the look of your home. There are a variety of options to choose from giving you the opportunity to be creative when taking your yard to the next level. Why should you have concrete landscape curbing? 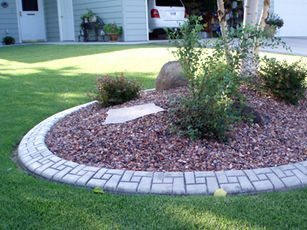 The main reason property owners install concrete landscape curbing is because they get tired of replacing rusted or broken landscape edging. Also, they do not like the look that green metal gives their landscape. 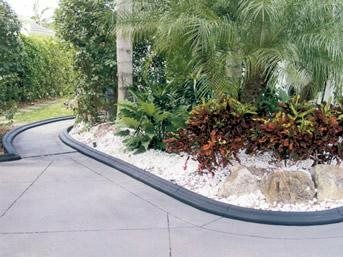 Concrete landscape curbing is the perfect solution to a long time problem. Extruded concrete can follow any curves and designs that your landscape may have. It's not like trying to bend metal to look like a curve. With a continuous border you will stop that unwanted grass and weeds from invading your flower beds. With the proper care concrete borders will last the lifetime of your home. First, the sod cutting and ground preparation is completed making the landscape ready for curb installation. This is done using a sod-cutting machine to cut a 6-9" wide strip of sod, and the crew using square shovels to remove grass, and level the ground. Once the ground preparation is completed we are ready for installation. Second the concrete is mixed on a self-contained trailer, and color is added to the exact measurement for the job. The mixture of cement sand, Portland cement, and a reinforced fiber is what creates a strong durable mixture. The mixture is a dry mix, and will resemble the look of wet sand. Once the concrete is mixed it is wheeled to the site, fed into the machine and extruded into a beautiful continuous border for your landscaped area. The crew will then finish out the curb depending on the type of curb you are installing, from using trowels or a stamping process to finish the installation. As an added precaution to ground movement control joints are cut 1/2in into the curb approximate every 12-18 inches to add flexibility to a very strong reinforced curb. This process is normally a 1-day process, and when the crew is completed your landscape will be as clean as when they arrived. Replacing Existing Edging With Concrete Curbing: Will it Effect my Landscaping? The installer will remove the existing edging, and cut a 9 inch wide strip of sod away from the outside edge of your existing landscaping. This will allow them to extrude the curb against your current edge. If you have any sprinkler heads on the outside of your existing landscape edge, they will need to be moved( in many cases the installer can do this for you). If they are inside your edging the curbing installation process will not affect them. Will I be Able to Mow up Against my Curbing? Your curbing will be as strong as 3000psi (verify with your installer) and will with stand your mowers weight to ride along the edge of the curbing. The blades of your mower will not damage your curbing, and will allow you to mow right up against it resulting in less time spent weed eating around your landscaped areas. Are forms set to do concrete landscape curbing? No, a machine that extrudes the concrete into a continuous concrete border is used. Depending on the type and footage of the installation, it normally takes only 1 day. Do you use reinforcement in your curbing? Yes, in most cases reinforced fibers are used in the curbing. Verify this with the contractor. Will the color fade over the years? No, not if integral colors are used in the our mixture, and a sealer is applied to prevent fading. Resealing is good maintenance practice. Talk to your installer about how often to reseal. All concrete will crack. To control cracking control joints every 12-18 inches to allow your curbing to move. Verify the spacing of control joints with your installer. This 4x6 mold is mostly used for dividing flowers beds, but also can be used as a colored border. This mold is used for stamping. The concrete landscape curbing contractor can stamp this mold with several different types of stamps to include brick, and stone stamping. With brick and stone stamping, several different methods of coloring can be used to give the curbing a multi-colored, multi -dimensional look. Note that all contractors will not offer the same molds, same colors or same stamping choices. Review what is available with a concrete landscape curbing contractor in your area. 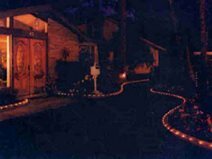 Lighted Borders can add a continuous light to your borders using a 12v or 120v rope lighting system. With Lighted Borders you can give a natural look to your home or landscaped areas with a spot light effect. Why spend all that time and money on your landscape to only see portions of it at night? With a continuous light you will be able to enhance your entire landscape designs at night, without being in the spotlight! Stamped borders can give you a more custom look of Brick or Stone. With several stamp designs to choose from and a wide variety of colors and color mixtures your designs are unlimited! Note that all contractors will not offer the same molds or the same colors or stamping choices. Review what is available with a concrete landscape-curbing contractor in your area.